After graduation, Mr. Nelke obtained a clerkship with the Honorable Mark M. Russello, Bergen County Superior Court. 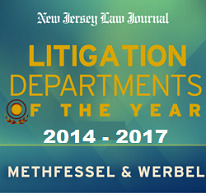 Following his successful clerkship, Mr. Nelke worked for a defense firm representing insurance carriers, insureds and self-insureds in the investigation and litigation of both first and third-party claims in New Jersey and New York. For 11 years he managed and supervised a litigation practice group, defended insureds and insurers in jury and bench trials across the state and specialized in the investigation and prosecution of fraud claims.